Catch Up TV services let you watch shows you’ve missed on a computer, or on your TV. It’s important to note that typically Catch Up TV only lets you watch content that’s been created for the broadcaster… so, for example, with 4oD, you’ll find Hollyoaks and Big Brother, but not an imported show like Friends that’s shown on E4. BBC shows for the last seven days are available free of charge via the BBC iPlayer. BBC shows are also available in High Definition via iPlayer. Content from ITV1, ITV2, ITV3, ITV4 and CITV is available on the ITV Player. Watch on a TV: Recent ITV content is available on-demand from BT Vision and Virgin Media. 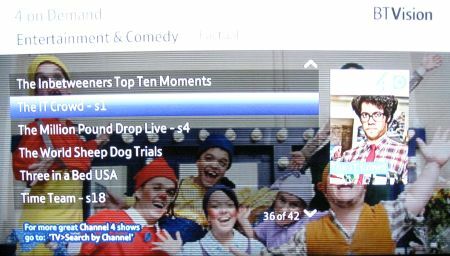 4 on Demand, also known as 4oD has our favourite interface of the services – easy to search and with a large catalogue of older Channel 4 shows and series. More on our 4oD Review. Watch on a TV: 4oD is available on-demand from BT Vision, Virgin Media and TalkTalk TV. Catch up with content from Channel 5, 5*, 5 USA and kids TV service Milkshake. Free content, download shows to rent for 14 days from 99p, or HD shows from £1.99, or buy them for keeps. Sky TV customers can watch and download programmes from over 30 channels for FREE on a PC, tablet or mobile phone using the Sky Go service. Non-Sky TV customers can subscribe to Sky Go to watch live TV channels and a selection of programmes on demand. Live TV is available, including Sky Sports, Sky Movies, Sky 1, Sky Atlantic, G.O.L.D, Eden, MTV, and ESPN. Watch on a TV: A small selection of content is available via Sky Anytime – downloaded automatically to reserved disk space on Sky+ and Sky+HD boxes. Also available: You can also access the Sky Player via a Microsoft XBox 360 and on an iPhone / iPad. The best way to watch TV is on a TV set, and not on a PC screen – so here’s our round-up of the TV services that offer catch-up TV on your telly. BT Vision: Watch Catch-up TV from BBC, ITV, Channel 4 and 5. YouView The new YouView TV service offers access to BBC, ITV, 4oD and Demand 5 on your TV. The service is subscription-free, and offers a clever 7-day backwards EPG for easy access to show that you’ve missed over the past week. A great way of watching catch-up on your telly. BT Vision BT Vision offers BBC, ITV, 4oD and Demand 5 on your TV. The TV Replay service on BT Vision is included for free as part of TV packages. Virgin Media Virgin Media offers catch-up TV content from BBC, ITV, Channel 4, and Channel 5. It’s free with all TV packages. Sky Sadly, no catch-up TV services for BBC, ITV, Channel 4, or Channel 5. However, If you have a Sky+ or Sky+HD box, there’s a small selection of Sky content downloaded to part of the hard drive as part of their Sky Anytime service, but it’s pretty limited. There are rumours that as Sky’s boxes have an Ethernet socket, they may start a true on-demand service at some point in the future. More on Sky at www.sky.com/shop or on our Sky page. TalkTalk TV TalkTalk TV (formerly Tiscali TV) offers catch-up TV from BBC, Channel 4 and FX for free. This is delivered via your phone line to a special Tiscali TV set-top box that’s connected to your TV. Freeview No Catch-up TV service offered as standard, but some TV sets and Freeview boxes offer access to BBC iPlayer. Freesat No Catch-up TV service offered as standard, but some Freesat boxes offer access to BBC iPlayer. Got a question on UK Catch-up? Ask in our Internet TV forum! Other Internet TV services listed on our UK Internet TV page. PODCAST FEATURE: We featured Catch-Up TV in Show 42 of our online radio show. Why don’t you use spaces between words?